"If you think you can't do it, keep reminding yourself that you were literally made for this. Designed by nature, to create this human, birth this human, & feed this human. Just looking at her makes everything bad about labor fade into a distant memory, when it literally happened hours ago. I have not been able to stop smiling. I was one of those moms that literally got no break during contractions. From 7cm till pushing my contractions were one on top of another and I'm not even exaggerating. The midwife told me I was the first person she's ever had with contractions that close together for that long. I was having irregular contractions at night on the 25th—nothing that was hurting, just tightening at the top of my uterus that felt like her body was in my ribs, but really it was my uterus contracting. They were probably like 30 min apart and I could sleep through most. I woke up on the 26th with that same tightening about the same time apart until about 6pm, when they started to get a little more cramping to them. So it was the tightening and the cramping at this point, but I could lay through them and just rested as much as I could because I really thought it was prodromal labor. Around 2am they started coming 6-10min apart and got a little worse where I had to breath through them, but I could still lay down and I tried to sleep between. At that point I texted my doula, Jess, and she said to just text her when I wanted her over. They stayed this way until about 5am when they changed to about 5-8 min apart and I wasn't able to lay down through them anymore, I had to get on all fours. Again, they weren't too painful, I just had to sway my hips, but I could still talk through them. I texted Jess again to let her know, and I told her I'd text her when I wanted her to come. At around 6am I told her to head over because they were getting intense and I couldn't talk through them anymore. I was still coping, I just wanted to make sure she was there since I didn't know how fast they would progress. They were about 3-5 min apart at this point. She got to my house around 7am and they were around 4 min apart, so she texted my birth photographer to head over and called the birth center for us. She massaged my back and legs while I held on to Jc through contractions, & I was getting through them but still having about 3 min breaks in between which felt like an infinity. We waited for the birth photographer/videographer to get to my apartment to get some shots in the house before we left. She got there around 9:30, and at that point my contractions were 1-3 min apart and some were back to back. She got about 30 min worth of footage & we headed to the birth center, which is 9 min from my house. I had 2 contractions in the car, and it's true what they say, those car rides are awful. Once we got to the birth center I asked for a cervical check expecting the worst and thinking I was at like a 5, I was so relieved when she told me I was at a 7 & doing great. At this point my water was still intact, but my mucous plug was falling out in chunks. They started getting the tub ready, but I needed immediate relief, so I jumped in the shower. So amazing! Having that water on me relieved so much pain. Every time I had a contraction, Jess would hold the water on my back and Jc would apply hip pressure. It became the only way I could get through contractions. I think I yelled, "more pressure!!" about 100 times. I stayed in the shower for about 2 hours and then got in the tub and asked for another check. She said I was at an 8 with my water still intact. I loved the tub, I was on all fours and had Jc and Jess applying back pressure through every contraction, but I almost never got a break. I kept telling myself I was in transition & Jess kept assuring me she was close. It was around 12:30pm at this point. 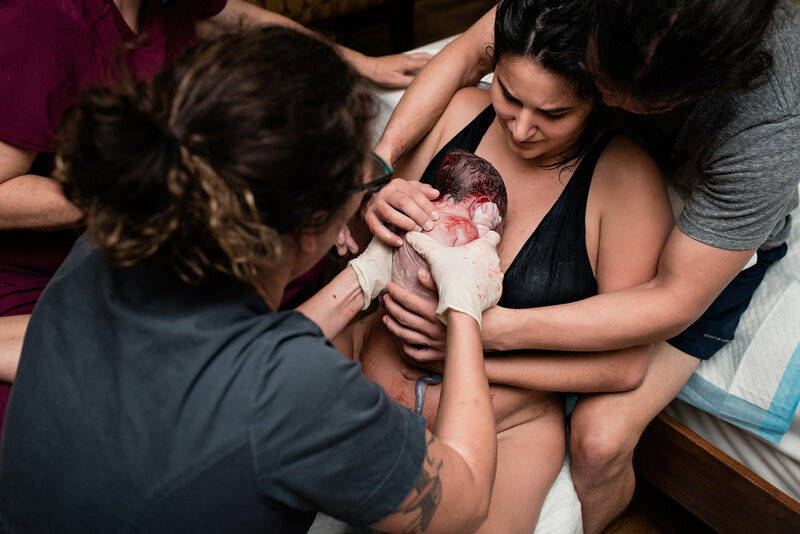 I stayed about two hours in the tub, but wanted to be checked again because I could feel water bulging & wanted my midwife to break it so we could move things along. My contractions were already right on top of each other and I was exhausted. I got out and she checked me, saying I was at a 9 and doing great, and if I wanted my bag popped it would speed things up a little, but I didn't have to. I told her to just do it. After she ruptured me, I labored on the bed for about 30min on all fours, then went back in the shower. I could have stayed in the shower the whole time if I wasn't so tired. I couldn't hold myself up anymore so after about 30 min in there, I decided to get back in the tub and a couple contractions in I felt the urge to push. I kept checking her myself and felt her little wrinkly head about two knuckles in, and I knew she was going be here in the next few hours. It was around 3:30 at this time and I started to really bear down and push in the tub. I was grunting so loud and it actually felt really good to counter the contractions with an action instead of just letting them be. I couldn't progress fast enough in the tub and wanted to be on the toilet so I asked if I could go and they said yes, but asked if it was because I thought I had to poop. I said no, I just wanna push and I feel like I would do best there. So midwife let me push on the toilet for two contractions while she went to get the birth stool so I could push by the bed. It was around 4:30 when I got on the stool and my midwife said she would be here any minute, I just needed to push. So I pushed like a freaking wild animal. I could feel the pressure of her head and all I wanted was to get her out as fast as I could. I pushed and pushed on that stool for about 3 contractions, but instinctively I wanted my legs up and pelvis forward. I asked them to grab my legs, rotated my pelvis and that pushed her into the right position and I got her out in 2 contractions. I had a tiny tear that didn't need to be stitched & was so relieved! I seriously thought my entire perineum was ripped around from the birth. The ring of fire is no joke and seriously makes you put your pushing pants on. I knew as soon as I got her head out everything would be okay. Avie Ryan was born at 4:44pm and I couldn't even cry because I was just so filled with happiness that I literally was in another dimension. It was the hardest and most rewarding thing I have ever done in my life. Feeling her on my chest after all the hard work is what heaven probably feels like. It was amazing and so, so worth it. Don't get me wrong, it's HARD and it's painful, but you can get through it with the right mindset and the right birth team. Don't be afraid of one of the most natural and amazing experiences we as woman are able to have. Living this life means getting through the hard parts and knowing there is the most amazing gift at the end of it. It makes that gift a million times sweeter.